THE Spiritual Science Movement has often, since its inception, been confused with various other tendencies in existence at the present time. It has been accused, in particular, of desiring to implant one or another of the Oriental spiritual influences — for example, Buddhism — into western culture. For this reason, the subject of today’s lecture should have a special interest for spiritual research, for it will present certain observations concerning the respective significance of Buddhism and Christianity from the standpoint of Spiritual Science. Anyone who has made himself in some degree acquainted with the nature of Buddhism, will be aware how its Founder, Gautama Buddha, evaded all questions concerning the evolution of the world, and the foundations of human existence. He would not speak of these. He would speak only of the means by which mankind could enter into a form of existence that was satisfying in itself. The function of Anthroposophy, or of Spiritual Science is not to acknowledge allegiance to any particular name, but only to what is capable of investigation as a Truth, unconnected in our day with any names whatsoever. The fact that the teaching of Reincarnation, or repeated lives on earth, is also to be found in the teaching of Gautama Buddha, although in an entirely different form, is analogous, where present day Spiritual Science is concerned, to the fact that elementary geometry is also to be found in Euclid; and just as little as it is justifiable to accuse every teacher of geometry of perpetrating ‘Euclidism,’ so is it equally unjustifiable to accuse Spiritual Science, when it makes the teaching of Reincarnation its own, of being ‘Buddhism’ just because similar concepts were also taught by Buddha. Nevertheless, it is necessary to point out that Spiritual Science is the instrument which we must use in order to penetrate into and to test the source of every religion, whether it be the religion which is at the foundation of the whole of our European culture — Christianity, or whether it be Buddhism. If we would now, in the sense of Spiritual Science, enter thoughtfully and deeply into the spirit of Buddhism, so as to be able to compare it with the spirit of Christianity, we shall do better if we do not at once turn to the great doctrines — which can so easily be interpreted in different ways — but rather try to construct a picture of the immense significance and far-reaching results of Buddhism from various symptomatic facts which concern its whole disposition and presentment. This can best be done if we consider first of all a Buddhist scripture which is held in high esteem; and that is the questions which were put by King Milinda to the sage Nagasena. Here we are given a conversation which draws out the very spirit of the whole trend of Buddhist thinking. The powerful, spiritually-minded King Milinda desires to question Nagasena, the sage. The King, who has never been at a loss in the presence of any sage because he always knew how to evade anything that was said in opposition to his own ideas, comes to Nagasena to speak with him about the meaning of the ‘Eternal,’ — the meaning of the immortal part of human nature which passes onwards from incarnation to incarnation. So Nagasena showed how what is once there in any one earth-life strives to reappear transformed, as effects, in later lives. It is easier to gain a sensitiveness towards the whole spirit of Buddhist teaching by such examples as this, than by a study of the main principles, for the latter can be interpreted in various ways. 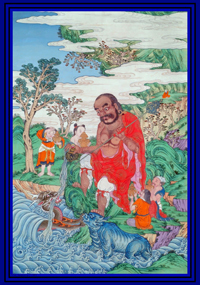 If we let the spirit of these analogies work upon us, we see clearly enough that the Buddhist desires to wean his adherents from the idea of what may be regarded as the separate individuality, the definite personality, and to point out above all things, that that which reappears in a new embodiment, is — it is true — the result of this personality, but that one has no right to speak of an uninterrupted ‘I,’ in the true sense of the word, as extending from one incarnation to another. Now if we turn from Buddhism to Christianity, we can — though such a comparison has never been selected before — use this instance of Nagasena in the Christian sense, and represent it somewhat as follows. But by the ‘Name’ something particular is denoted. And thus we are led to something which is non-existent in any of the parts! Hence arises the striving of the Buddhist spirit away, so to speak, from what is perceived, in order to surmount it and to deny the possibility that anything particular attaches to what is seen. The spirit which imbues the Christian way of thinking — and this it is that concerns us — perceives the separate parts of a carriage, or of any other object, in such a way that the tendency is to turn from the parts to a recognition of the whole. And because of this difference between the Buddhist and the Christian conception of things, remarkable consequences arise out of each of them. A man stands before us. He is constructed out of several parts. This man busies himself in the world, and performs various actions. And while he appears thus before us, his Buddhist attitude of thought causes him to feel the worthlessness and unreality of everything around him. But he is led to free himself from his attachment to nothingness, so that he may rise to a higher existence in reality; to turn away from all that his eyes behold, and from everything that he can gain. by means of all possible human knowledge. Away from this world of the sense-perceptions! For everything that it offers, when it is conceived only as Name and Form, reveals itself in all its emptiness! There is no truth in anything belonging to the physical world! Now whither does the Christian conception lead us? It does not regard the separate parts as separate, but regards them in such a way that one indivisible unity and reality is perceived ruling among them. It regards the hand in such a way that it is seen to be a hand only because a man, using it as a hand, makes it a hand. Therefore here is something (a man) which as it stands before us, immediately and inevitably suggests that which stands behind it. When we, as knowers of Spiritual Science, consider Reincarnation from the Buddhist standpoint, we must express it thus: — that that of which man is the unified expression in his earth-life, has no value, for his deeds alone have their effects in the following incarnation; while in the light of Christianity, that which makes man a unity in his earthly life is the fullness of his Ego. That has value; and that it is which carries the fruits of one incarnation onward into the next. Thus we can see that a certain quite definite configuration of thought, which is far more important than theories and principles, cleaves these two great world-conceptions most powerfully asunder. If we were less prone in these days to depend so much upon theories, we should find that we could far more easily arrive at an understanding of the main characteristics of various spiritual tendencies by turning our attention especially to their symptoms, to their methods of presentation. And that holds good both for the Buddhist and the Christian conceptions. In the conversation described we have the very core of the Buddhist conception as expressed by the great Founder of Buddhism himself. The theme of the present lecture is certainly not intended to develop a line of opposition against the Founder of the Buddhist world-conception, but rather to portray his world-conception quite objectively and in, accordance with its true characteristics. There then arose before his soul the picture of what he called ‘the thirst for existence.’ Since we look out upon the world and see that sorrow is everywhere, we are compelled to say: Man is bound to have sorrow if he enters into this world of sorrow; but what is the cause of his suffering? The cause is this: that he desires, that he thirsts to be incarnated in this world. The passionate longing to forsake the Spiritual World and enter into a physical body, and in it to become aware of the outer material world — that is the cause of this sorrow-filled human existence. Hence there is only one way to escape from sorrow, and that is by conquering the thirst for life. And this thirst for existence can actually be overcome when, according to the teaching of Buddha, men can learn to unfold within themselves the so-called ‘Eight-fold Path,’ which, so it is generally said, consists of right judgment, right discrimination, right speech, right deed, right living, right aspiration, right thinking, right contemplation. Thus through the right attitude towards life, according to the great Buddha, there arises by degrees within men’s souls something which destroys the passionate longing for existence, something which brings them so far that at last they are no longer compelled to descend into physical incarnation, but are liberated from an existence which is overwhelmed by sorrow. These things, according to Buddha, constitute the Four Noble Truths: viz., the knowledge of sorrow; the knowledge of the causes of sorrow; the knowledge of the necessity for liberation from sorrow; and, lastly, the knowledge of the means of liberation from sorrow. These are the Four Holy Truths which Buddha, after his enlightenment under the Bodhi-tree, gave out in the great sermon at Benares, about the fifth or sixth century before Christ. Liberation from the pain of existence! That is what stands in the forefront of Buddhism, and it is that which makes it possible to describe the religion of Buddha as a ‘religion of redemption’ in the highest sense of the words; a religion of redemption from suffering; and since all existence is bound up with suffering, a redemption above all, from the continuance of rebirth. That is entirely in accordance with the type of the presentation of Buddhism which is embodied in the Nagasena conversations. For in the moment that human thinking, which embraces the outer world of the senses, beholds its worthlessness, when that which is a mere gathering together of parts possesses for the thinker only Name and Form; when nothing passes from incarnation to incarnation save the results of existence, then it must be said that ‘true’ existence is only attained when man is able to overcome and transcend everything that is to be found in the external world of the senses. Now it is not correct — and this can be perceived even by the simplest method of observation — to say that Christianity is a ‘religion of redemption’ in the same sense as Buddhism. 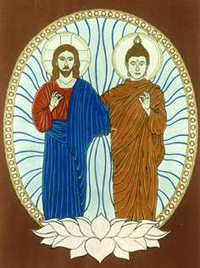 If we place Christianity in its correct relation to Buddhism, we can speak of it as a ‘religion of re-birth.’ For Christianity proceeds from the knowledge that everything which in its totality represents man in a single life, is fruitful, and these fruits have importance and value for the innermost being of man, and are carried over by him into a new life and brought, in that life, to a higher state of perfection than in the previous one. Everything that we experience and absorb in a single life always appears again and grows ever more and more perfect until it is revealed at last in its true spiritual form. What is apparently worthless in our existence, when it is taken hold of by the spiritual, has its resurrection in a degree more perfect than before — is spiritually embodied. Nothing in existence is worthless, because it rises again if the spirit has entered into it rightly. The thought-content of Christianity is a religion of re-birth, a religion of the resurrection of the Best that we have experienced; a religion wherein no single thing that is round about us is a ‘nothingness,’ but wherein all things are building stones for the completion of a great edifice that is to arise through the gathering together of everything spiritual from out of the world of the senses. Buddhism is a religion of liberation from existence; while Christianity is the opposite, a religion of Rebirth upon a more spiritual level. This is revealed in the least as well as in the greatest of the forms of its presentation, no less than in its fundamental principles. And if we look for the actual reasons of this difference between the two religions, we can say that they arise out of the entirely opposite nature of the character of oriental and western culture. There is a very radical difference between the method of presenting things that spring from the culture that gave birth to Buddhism, and the method that springs from that culture into which Christianity poured itself. It is possible to describe this difference quite simply. It lies in the fact that all true oriental culture, which has not been fertilised by the West, is non-historical; whereas western culture is historical. That is the ultimate root of the difference between the Christian and the Buddhist conceptions. The Christian conception recognises that not only are there repeated lives on earth, but that history rules in them; that is to say, that what to begin with, can be experienced at a higher and more perfect stage, can continue to become more and more perfect throughout the course of the succeeding incarnations. Where Buddhism sees the liberation from earth-existence in the ascent to Nirvana, Christianity sees, as the goal of its evolution, that everything engendered, everything achieved, in each single earth-life, ascends to ever higher and higher degrees of perfection until, spiritualised and transfigured, it consummates its resurrection at the end of the world. Christianity, and the Old Testament also, point to a definite occurrence whereby Man evolved something within himself that causes him, through his inner life, to make the world his source of sorrow. Hence it is not the external world in which we are ‘made flesh,’ not that which enters through our eyes, and echoes in our ears which brings us sorrow; it is that which the human race once unfolded within itself which placed it in a wrong relation to this external world. And this was an inheritance which passed from age to age, so that mankind today still suffers pain. Thus Christianity points out that this state of things arose when humanity itself was at the beginning of its earthly existence. We can enlarge upon these two aspects of the foundations of both religions. Buddhism for ever emphasises that the ‘world is Maya, is Illusion!’ Christianity asserts: ‘It is true that, to begin with, what man beholds of the world is illusion; but that arises from man himself, who has so formed his organs of perception that his vision cannot penetrate to the Spiritual World. No; it is not that we are surrounded by Maya, but that man is so imperfect a being that he cannot perceive the true form of the world. And so Christianity seeks, in pre-historic ages, the event that made the human heart become incapable of creating the true conception of the physical world. Therefore, through many incarnations of development, we have — in the Christian sense — to re-attain the state of spiritual sight and hearing before the true form of the outer world can be perceived. Repeated incarnations are, therefore, not meaningless, but they are the way towards the perception, in the light of the Spirit, of that from which the Buddhist would escape: i.e. the way to the finding of the spiritual within the physical. To overcome this world, which appears to us now as a physical one, to overcome it with something which man does not yet possess, but which he can attain as a spiritual reality; to overcome human Error which sees the world as Maya — that is the inner impulse of Christianity. And so the Teacher of Christianity is not One Who says: ‘The world is the well-spring of sorrow! Escape from it to another that is utterly different — attain Nirvana!’ But Christianity sets before us as the mighty Impulse for the forward evolution of the earth, the Christ, Who pointed, in the strongest possible way, to the inner being of man, where from he could unfold the power to use every incarnation that he has upon earth in such a way that he can carry the fruits of it forward to his future incarnations through his own strength. Not to bring the course of his incarnations to a close and enter Nirvana, but to use all he can of them, to work further upon their results, so that he can spiritually experience Resurrection. There we have the great distinction which makes Buddhism on the one hand a non-historical, and Christianity on the other hand, an historical conception. The Christian idea seeks in the ‘fall’ the origin and source of man’s pain and sorrow; and in a ‘resurrection’ the healing of them. ‘You will not be freed from pain and sorrow by departing from earth-existence; but you will be set free when you correct the Error which gives you a false relation to the world. The source of sorrow is in yourselves! If you perceive aright, you will know that the outer world indeed and in truth melts away like mist in the sun, but all the deeds that you have done in the world, all your experiences, it will bring to a resurrection in the Spirit!’ This is Christianity as a ‘religion of Re-birth,’ a religion of Resurrection. And only thus can it be placed beside Buddhism. That is to say, only in the sense of spiritual-scientific thought can these two be compared, and their deepest impulses understood. What has been indicated here can be verified in the minutest particulars. For instance, one can find in Buddhism something like the Sermon on the Mount. He that hears the Law — i.e. what Buddhism communicates as the Law — is blessed. He that can live with all creatures and does no evil towards them, is blessed. We can regard the Buddhist beatitudes side by side with the Sermon on the Mount as it is given in the Matthew Gospel; but we must understand them aright. Let us compare them for a moment with what we find in St. Matthew. First we hear the mighty words: ‘Blessed are the poor in Spirit, [(Dr. Steiner gives this sentence as ‘Blessed are those who are beggars for the Spirit.’)] for theirs is the Kingdom of Heaven.’ Here it is not only said ‘blessed are those who hear the Law,’ but another sentence is added: It is said, ‘Blessed are they who are poor in the Spirit, so that they must beg for the Spirit, — for theirs is the Kingdom of Heaven.’ What does that mean? Now one can only correctly understand such a sentence when one brings the whole of the historically conceived teaching of Christianity before the mind’s eye, and then one recognises that all human soul-capacities have passed through a ‘history,’ — that they have all evolved. Spiritual Science clearly and truly understands the word ‘evolution’ in the sense that what is present today, was not always present. It tells us that what we possess today as our reason, our scientific thought, was not in existence in primeval times; but instead, there was present in humanity what might be called a dark, dim clairvoyance. Men did not come to their knowledge of external things in the way they do today, but something arose within them like an archetypal wisdom, far surpassing what we ourselves can achieve. Whoever knows history, knows that such a primeval wisdom existed. Though men did not know how to construct machines and railways, and rule the surrounding world by means of the forces of Nature, yet they had a knowledge of the divine-spiritual foundations of the world infinitely transcending our own. But it would be quite wrong to suppose that their knowledge was gained by thinking. On the contrary, it rose up in their souls as though bestowed upon them, as revelation, as dim inspirations rising within them without their co-operation, but so that they were there as real images of the Spiritual World, a really present archetypal wisdom. Human progress, however, consisted in the fact that from incarnation to incarnation this shadowy clairvoyance, this wisdom, had to grow less and less, for it was necessary that it should be lost in order that man might learn at last to grasp the things of the world by his reason. In the future, man will be able to see clairvoyantly into the Spiritual World, and at the same time will possess the forms of his present knowledge. Today we are in an intermediate state. The old clairvoyance is lost, and what we now possess has been developed through long ages. How has mankind arrived at a knowledge of the world through his reason, and from out of his own innermost self-consciousness? And when, more especially did self-consciousness appear? It was at the time (though as a rule the evolution of humanity is not observed with such exactitude as this) in which Christ-Jesus came to the earth. At that time, humanity stood at a turning-point in evolution when the old clairvoyance had gone, and which was the starting-point of that which has brought about our greatest achievements. The entrance of Christ into the world-evolution was the turning point from the Old age to the New, from the old to the new world-conception! And there is, moreover, a technical expression for that stage of achievement which it was then possible for mankind to experience, when men had begun to know the outer world through their own self-consciousness; an expression which is used by John the Baptist when he proclaims that ‘The Kingdom of Heaven is at hand!’ That means: ‘The knowledge of the world in ideas and concepts is at hand.’ In other words: ‘Man is no longer directed to the old clairvoyance, but he must, from out of his own being, learn to know and investigate the world.’ The tremendous impulse for that which man had to gain by means of his own Ego, and not through the Grace of Bestowal, that was given by Christ-Jesus. Thus, there are great depths of meaning hidden even in the first words of the Sermon on the Mount, which might well be expressed as follows. Humanity stands today at that stage when it is a ‘beggar for the Spirit.’ Previously, men possessed clairvoyant vision and could behold the Spiritual World. That is now lost. But a time is coming, through the power of the Ego, through the inner revelation of the Word, when men will find a substitute for the old clairvoyance. Therefore — ‘blessed’ are not only those who in ancient times attained to the Spirit through dim inspirations, but also those are ‘blessed’ who have no clairvoyance, because to lose it is the course of their evolution. Oh! — they are not unblest, they who are beggars for the Spirit, because they are ‘poor in the Spirit’! Blessed are they, for theirs is that which is revealed to them by their own Ego, is that which they can attain through their own Self-consciousness! The source of that righteousness which shall counterbalance the unrighteousness of the world, is now to be found in the Ego itself. To this also belongs an event which at first appears as a wholly painful one in the Christian doctrine, namely, the death of Christ-Jesus, the Mystery of Golgotha. This death has not the usual significance of other deaths. On the contrary, Christ reveals the truth that this death is to be the starting point for an immortal and unconquerable Life. It is not merely an event which releases Christ-Jesus from life, but it is an event passed through because it leads to an ascending process, and an eternal and infinite ‘living’ flows from it. This is something (and it was so accepted by those who lived in the first centuries after Christ) that will become more and more recognised when the understanding of the Christ Impulse will have grown greater than it is today. When that time comes, men will understand that, six hundred years before the Christian era, one of the greatest of human beings, leaving his palace and finding a corpse-finding Death — could conceive of it thus: ‘Death is sorrow!’ ‘Liberation from death is Redemption,’ and that he could have nothing to do with what lay under the dominion of Death. Six hundred years pass, and we come to the time of Christ. And when yet another six hundred years have passed, a symbol is raised up for that which only the humanity of the future will understand. What is this symbol? It is not a Buddha; it is not any ‘Chosen One.’ No — simple men passing by saw the symbol of the Cross, and upon the Cross, a dead body; and they did not say, ‘Death is sorrow!’ They did not turn away from it, but they saw in this dead body what became for them a bulwark of the eternal in life; they saw what conquers all Death, and points to the transcendence of earthly things. The noble Buddha saw a corpse — and he turned from the material world with the judgment that all death is sorrow; while those men of simple nature who beheld the Cross and its dead burden did not turn away, but gazed upon it because they found in it a witness of the everlasting life that streams from the earthly death! And so six hundred years before the Christian era, Buddha stands before the corpse; and six hundred years after the death of Christ, the simple man of the world beholds that symbol which expressed what had happened with the founding of Christianity. Never in the whole history of human evolution has such a transformation taken place as this! And the more objectively these things are grasped, the more clearly will the great significance of Buddhism emerge. We have shown how mankind once possessed a primeval wisdom, and how in the course of many incarnations, this wisdom gradually declined. The appearance of Buddha marked the close of the old development; it was a mighty world-historical indication that the ancient archetypal wisdom was lost. In the historical sense this explains the ‘turning away’ from life. Whereas Christ marks the commencement of a new development which sees this life as the source of the eternal. Hitherto, there has been no explanation of these immensely important facts of human evolution. Therefore, and because these things are not yet understood, it sometimes happens that in our time there can be such beautiful and noble natures (as for instance, Theodor Schulze, who died at Potsdam in 1889) who, because they cannot find in any external concepts what truly fills their rich inner life, try to find satisfaction in Buddhism. And Buddhism reveals to them how, in a certain sense, the human being when he raises himself by developing his own inner forces above the world of the senses, can transcend his own nature. That, however, is only possible because the greatest impulse, the very essence of Christianity, is still so little understood. Spiritual Science must some day become the means by which the core of the whole presentation of the Christ-Impulse can be more and more deeply penetrated. It is just the evolution-idea which Spiritual Science approaches so honestly that will lead humanity to an exact and intimate grasp of Christianity, so that Spiritual Science may rest in the hope that the rightly comprehended Christian teaching will be unfolded more and more as against that form of it which is incorrectly apprehended, and moreover, without any transplanting of Buddhism into our modern times. It would, in fact, be a very shortsighted policy that would seek to establish Buddhism in Europe! For anyone who knows the conditions of the spiritual life of Europe, knows that even those tendencies which are apparently ranged against Christianity, have borrowed from it its whole arsenal of weapons. A Darwin, a Haeckel, would never have been possible—strange though this may sound—if it had not been for the educational systems of Christendom which alone made it possible for them to think the thoughts they did; if those particular forms of thought had not already been there which they, nourished in the Christian world, could then use as weapons of offence against their own Mother. For what they and others, have to say, is often apparently directed against Christianity — that is, in the manner of its utterance. But the thoughts could never have been there without the Christian education. For this reason, a grafting of any oriental system upon our own culture would be of no avail; for it would oppose every condition of the spiritual life of the West. It is only necessary to think clearly about the fundamental teachings of the two religions. And so Faust is made to ascend a rung of the ladder of existence which has its origin in Christian symbolism — the step from the mortal to the immortal, from death to life. That, indeed, is the true, the realistic, Christian impulse; for it leads to a re-awakening of earthly deeds as spiritual accomplishment. It is the re-awakening of the Best that can be achieved on earth. It is the Religion of Resurrection! It is in very truth a ‘realistic’ world-conception, which brings down out of spiritual heights, the loftiest content for existence into the world of the senses. Thus we can say that something like the light of a dawn shines out in Goethe — a self-comprehending Christianity of the Future, which, while acknowledging all the greatness and significance of Buddhism, yet negatives its renunciation of earthly embodiments, and points upwards to a great acknowledgment of every single incarnation in the whole great sequence. And so Goethe, in the sense of the true Christian of modern times, looks out over a past world from whose womb all have been born, and upon a present world wherein, if its true results are grasped, we achieve something which time cannot annihilate. And we can also add. — There is neither any Power nor any Time that can annihilate what is achieved in Time itself and which ripens as Fruit for Eternity.